Common Cold is very common disease and lasts for about 3 to 7 days. It is not a one time disease because it may be re-appear even several times in one year. Common cold is caused by viral infection in respiratory track. Common cold mostly affects Nose and some times also affect the hearing ability. Let's have a look on some common causes & symptoms of common cold. Common cold can be caused by many viruses but Rhino viruses typically cause common cold. Virus of common cold can be entered into your body through your mouth, eyes or nose. This virus can be entered into your body if you have any kind of contact with any of above contaminated objects and then touch your eyes, nose or mouth then you are at high risk of catching common cold. Common cold is not a serious disease and can be cured easily just by following given home remedies. Antiseptic and antimicrobial properties of garlic are very helpful in preventing and getting rid of common cold. You can prepare garlic soup by boil three to six cloves of chopped garlic in a cup of water and drink the liquid in a soup form. Drink it two to three times a day. Alternatively, you can mix some garlic oil with onion juice. Dilute this with some water and consume this 3-4 times per day. This simple method is also very helpful cure common cold. In addition, try to add more garlic into your regular food recipes because it is very helpful to boost your immune system to fight against infectious agents. A strong immune system helps prevent the body from several infectious or contagious illnesses like common cold. Natural spiciness of ginger helps clear congestion in the nasal passage. Ginger tea is highly beneficial in getting rid of common cold. Take about 10g of ginger and cut into small pieces of ginger.Now put into water. Boil the mixture. Once it simmers, strain the liquid and add half a teaspoon of honey to it. drink this lukewarm mixture twice a day. Red onions are very helpful to cure common cold. Onion juice gradually loosen up the mucus that has accumulated in your nasal passages and chest so that it can be easily removed from the body. Take one red onion and peel off. Now cut this into small slices. Pour some honey to soak the slices. Leave them overnight in an air-tight container in a cool place or refrigerator. Eat 1-2 honey-soaked onion slices in the morning. Alternatively, you can also prepare homemade red onion syrup to get rid of common cold. Take 2-3 red onions, peel them and cut them into small horizontal slices.Now put one slice of onion in a small mason jar and add some raw honey to cover it. Repeat the process until the bowl is full with all slices. Now cover the jar and leave it at least for 15-16 hours. When you open the jar, there will be thick liquid like syrup. Drink a full tablespoon of the syrup 3-4 times a day to get relief from sore throat and common cold. Antibacterial and antimicrobial properties of honey are considered very effective to cure the symptoms of common cold. Take 1 cup of lukewarm water and add few drops of lemon juice. Drink this twice a day to get relief from common cold. Giving 10 grams of honey to sick person before going to sleep, significantly reduces the severity of symptoms of common cold including cough and sore throat. Note: Avoid giving honey to a child younger than 1 year old, as it often contains botulinum spores. While they’re usually harmless to older children and adults with strong immune system but infants with weak immune systems are not able to fight them off. Rich in anti-oxidants, green tea can help remove any toxins in the body as well as bacterial infections. 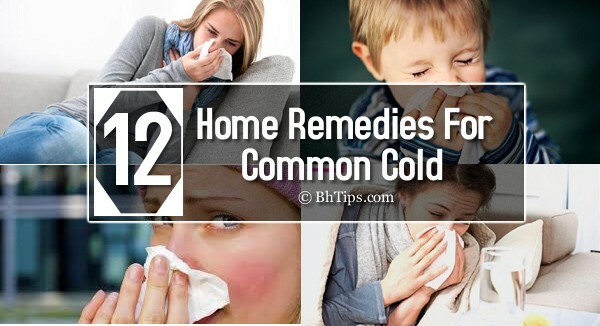 In addition, it also helps a lot in getting rid of the symptoms of common cold. To enhance the recovery process, you can add some honey and lemon juice in hot green tea. Take 1 green tea bag, one cup of hot water, one teaspoon of honey and one tablespoon of lemon juice. Let the green tea bag steep into hot water for 3-5 minutes. Add honey and lemon juice. Sip on when it becomes lukewarm. For best results, drink 2-3 cups per day. Apple cider vinegar (ACV) is also very helpful to cure the symptoms of common cold. ACV helps a lot to re-balance the pH levels of the body and makes the environment incompatible and unsuitable for the common cold virus to survive. Take 1 tablespoon apple cider vinegar and 1 teaspoon of honey. Mix them in one glass of warm water. Stir well and drink. For best results, repeat this process at least twice a day. Antiviral and anti-inflammatory properties of cinnamon are very helpful in treating the infection and in getting relief from symptoms of common cold. Take 1/2 teaspoon cinnamon powder and mix with 1 tablespoon organic honey. Eat this mixture to treat common cold. For best results, repeat this twice a day. Anti-microbial and anti-inflammatory properties of fenugreek are considered very helpful to treat common cold. Take 1 tablespoon of fenugreek seeds, one glass of water and 1 teaspoon of honey. Take a saucepan and put the fenugreek seeds water water. Turn on the stove and boil them for 8-10 minutes. Now turn off the stove and let this cool down. When it becomes lukewarm then add some honey and mix well. Drink this decoction while it is still warm. For best results, drink this twice a day. Eating foods rich in vitamin is an other great way to reduce the symptoms of common cold. People with weak immune system are at higher risk of catching the infection of common cold. Vitamins C not only supports the immune system to fight against the infectious agents but also prevents from the attack of infections like common like. Additionally, after consulting your doctor you can also take Vitamin C supplements. Getting enough Vitamin C not only boosts your natural defense system (Immunity) but can also relieve upper respiratory tract infections and other illnesses. Antioxidant, antimicrobial and gastroprotective properties of black pepper are very helpful to treat common Cold. Piperine compound in black pepper is highly beneficial in getting rid of many symptoms of common cold including cough and sore throat. Take 1/2 teaspoon freshly ground black pepper and mix in one glass of lukewarm water. Stir well and drink the decoction. For best results, repeat this process twice a day. Take 1/2 teaspoon freshly ground black pepper and mix in 1 cup of curd. Add some jaggery and have this mixture twice a day. If are suffering from sore throat, you can also gargle with 1 teaspoon of black pepper mixed in a glass of warm water. It will help to cure sore throat. If you are suffering from a runny nose, You can add or sprinkle some black pepper power to your food when you eat a meal. If you don't like or cannot eat or drink black pepper, you can still get the benefit from simply by smelling pepper throughout the day. Turmeric contains curcumin which has antibiotic and antioxidant properties. Turmeric mixed in warm milk is highly beneficial to fight against the symptoms of common cold. Take half teaspoon of turmeric powder and mix in 1 glass of warm milk. Drink this before going to bed. Repeat this every night until the all symptoms of common cold go away. Drinking a glass of warm turmeric milk before sleeping helps a lot in quick recovery from the infection of common cold. Probiotics present in yogurt can help to reduce the inflammation within the body and significantly reduce the symptoms of common cold. Having a cup of yogurt with meals or in between meals is very helpful in boosting your immune system as well as in getting rid of common cold. Try to consume at least 2 cup of yogurt on a daily basis until you get relief from common cold. (i) People suffering from common Cold should sneeze into a tissue Paper. Sneezing and coughing into tissues may help to prevent the spread of germs. (ii) After sneezing or coughing, throw away used tissues immediately and always wash hands after sneezing and coughing. (iii) Teach children good hygiene practices. Ask children to sneeze or cough into a tissue paper and then through away the used tissue. Always encourage them to wash their hands thoroughly on a regular basis. (iv) Avoid sharing items, objects or utensils with others. Try not to share your contaminated cups, glasses or utensils with others. (v) Avoid Sugar and sugar products. Sugar weakens your immune system. (vi) Try to improve your immense system by eating a healthy and well balanced diet. Adopt a habit of regular exercise. A body with strong immune system is less prone to catch a common cold. (vii) Try to consumes warm beverages including teas and chicken soup etc. Warm beverages not only help in soothing the symptoms of common cold but also reduces inflammation of the lungs which causes congestion/coughs. (viii) If You don't get relieve by following above home remedies, you must consult your problem with a professional Health care adviser or medical doctor.